With our Design Your Own Door System software you can make your vision come alive ! We have many different styles of panels to choose from. Pre-finished paint options on our fiberglass panels, choice of hardware color , and if its a custom panel size you are looking for we can do that too. A Sliding Doors system brings the outside in and the inside out creating that indoor outdoor feeling . With many different configurations , panel options , and hardware options we have to offer these door systems are ideal for any exterior door replacement , remodel upgrade and even interior room separations. If you love fresh air, enjoy indoor out door living, you are looking to add value to your home or simply just wanting that wow factor then a sliding door system is what you need. With their solid structure, durable powder coating with unlimited color option, and endless design ability’s, it is by far the best option for any custom home. We make our Steel Doors in house and specialize in custom builds. Our sliding glass doors are extremely energy efficient, very strong and structurally sound. Our unique blend of rigid aluminum framing with a long-lasting, low maintenance vinyl capping creates a unique combination not available from other manufacturers. With the rotation of a lever and a gentle nudge, AG Millworks Lift and Slide Patio Doors move entire walls out of the way, blending interior living spaces with the great outdoors. European retractable roller and gear technology, teamed up with the smoothest sill surface in the industry insures that even the most massive door panels will slide effortlessly and lock with ease. Made in the USA, our doors are energy efficient and fully customizable with panels, divided lites and lock rails. Exquisite wood surfaces on the interior provide warm, luxurious design details. Thick extruded aluminum exteriors with durable baked-on Kynar paint in any imaginable color completes the picture. Lift and Slide Patio Doors are also available with wood exteriors (limited warranty). Expand your world view with AG Millworks Lift and Slide Patio Doors. WE HAVE MANY OPTIONS AVAILABLE TO FIT YOUR HOMES DECOR. Beachside Concepts was established in 2013 with only a few intentions. Those intentions were to bring a quality, affordable option to any home owners remodel or new construction project . 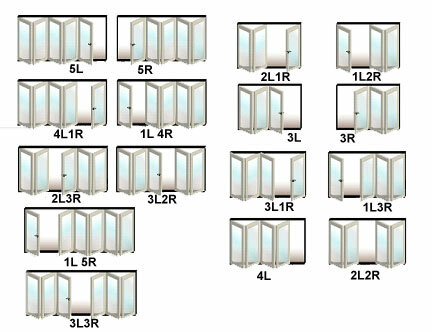 We specialize in Folding Door systems. These systems are becoming the first option over a sliding glass door or french door because of the amazing appearance and functionality. © Copyright 2017. All Rights Reserved. Beachside Doors.